1211 E Debbie Ln, Ste 129, Mansfield. 682-518-1235. 11am-10pm Sun-Thu, 11am-10:30pm Fri, 4:30-10:30pm Sat. All major credit cards are accepted. In a strip mall in Mansfield lies a treat for the senses, La Gondola. La Gondola sits in the same Mansfield strip mall as the sublime Blue Mint and the exceptional Simply Burgers. If you favor Asian over Italian, you may have all but ignored the small restaurant with the sherbet-colored d�cor. Who would think that a place in a strip mall in Mansfield would be a source of good Italian food? But the restaurant has a surprisingly wide selection of traditional Italian eats, touching on the cuisine of the northern region bordering France and Neapolitan fare, as well as the food of the southern sea regions. There are eight kinds of panini, six ways to order your chicken, a veritable ocean of shellfish and seafood, and even four veal dishes. So while you nibble on the crunchy, garlicky buttered bread served as a starter, you might be at a loss as to what to order next. You could do a lot worse than the calamari in umido (meaning �wet,� as in �not fried�). It may sound Japanese, but it�s Italian: calamari saut�ed in a marinara-type sauce. The squid came out al dente without being rubbery, and the �wet� version was a refreshing change of pace from the typical fried version (also on La Gondola�s menu and also probably tasty). A yummy side note: All of La Gondola�s lunch entr�es come with a side salad that features an incredible Italian dressing: tart, garlicky, and � while described as �creamy Italian� � was not like the gloppy bottled stuff you may be used to. La Gondola�s version had herbs, garlic, and pepper ground into a paste in a kind of emulsion with EVOO. It�s made in-house, and it�s delicious. Perhaps the best part of the entire lunch was the capellini pescatoro: a huge mound of mussels, clams, shrimp, and more of that �wet� calamari sitting atop delicate angel hair pasta. The garlic, white wine, and clam sauce provided the perfect accent � you knew there was a sauce on the baby-fine pasta, but it didn�t interfere with the fresh taste of the seafood. The gorgeous lunch-sized filet was cooked perfectly and came with saut�ed onions and fancy home fries, a.k.a. �Lyonnaise potatoes,� no doubt a bow to Italy�s fancy neighbor to the north, a.k.a. France. La Gondola offers a choice of specials to augment the menu. 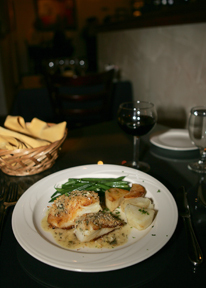 A recent one was chicken cordon bleu served with your choice of pasta or lightly steamed vegetables. The lovingly rolled chicken featured enough mozzarella in the center to produce one of those long cheesy strings that usually only happens with pizza. It was good, but in comparison, not as good as either of the other dishes. There are desserts, too, including the traditional spumoni and tiramisu. Neither is made in-house, but the tiramisu was so moist and delicious you�d have thought it was. The cr�me brul�e is made in the kitchen, and it was exceptional. A perfectly crunchy crust sat atop a smooth, slightly orange-flavored custard. The Italians call it fiore de Sicilia � traditionally, a combination of orange water and vanilla. Definitely unusual and definitely worth getting again. Skip the cheesecake � it was from a box and tasted like it was from a box. The service was pleasant and efficient � if you were rushing in and out for lunch, you�d have had plenty of time. The restaurant is also a feast for the eyes, with beautiful banquettes and pastel colors. The lunch prices are slightly higher than average, but your lunch comes with a fairly large salad and generous portions. The only problem: Now there are three exceptional places to eat in Mansfield, all within inches of one another, which makes the area by Debbie Lane a definite foodie destination.